Are you tired of inactive managers and hosts? Here you can ask me for help or more info or spread the message our league promotes: staying active. 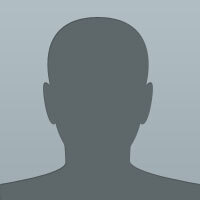 By clicking the link above, you will be sent to a spreadsheet containing all of Formula Zero's important statistics. This should be updated every race. This league is convenient for european people with time in the evening. It is considered by some to be the hardest FZ league overall. This league runs races in the evening for westernly players. Late races for Europeans are possible with this league. Potentially has the hardest elite tier to win a champ in of both of the R360 hosted leagues. This league is one of the non-r360 owned FZ leagues. FZIC is owned by Kavalio L, a dedicated league host and racer. The elite tier of this league is the most dedicated of the FZ leagues and this the place to go if you are searching for a large pool of experienced and fast managers! This is a new FZ league created by one of the most experienced FZ managers, Joshua J. For now rookie is by far the largest tier but as the league grows expect some fierce competition in FZ's earliest currently running league. Povi S is the only manager from FZW to win more than 3 consecutive elite championships. He reached 5. 3 of OFZ's 16 elite managers have only competed in Official Formula Zero and not come from other leagues (Peter S, Connor S & Dan K). Leo Y is the most experienced FZ manager, competing in 23 out of OFZ's first 25 seasons and 3 more since. That's over 1 year of racing! Peter S has the record for the most Manager of the Season awards (5). No manager has ever gotten more than 14 poles in a season in an FZ league. Only two managers in the history of the FZ leagues have ever been able to get 17 wins in one season (Sak K & Richard K). The last pro champion from OFZ to win an elite championship is Esko B who was the S23 pro champ over 10 seasons ago. Only Peter S and Povi S have managed to win 3 MotS awards in a row. Marc B has the record for the most amount of wins, 14, in a season in the elite tier any FZ league. This was achieved in S23 of OFZ. 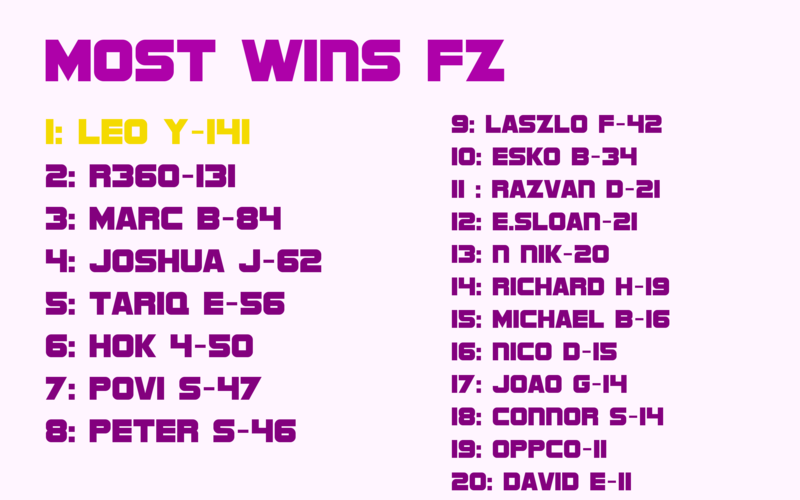 Hok 420 and Povi S have the record for the most amount of wins, 12, in a season in the elite tier of FZW. OFZ S28's MotS vote is the only one to have ended in a tie and consequently a re-vote to break the tie between Leo Y and Ariyatotle R who was the eventual winner. 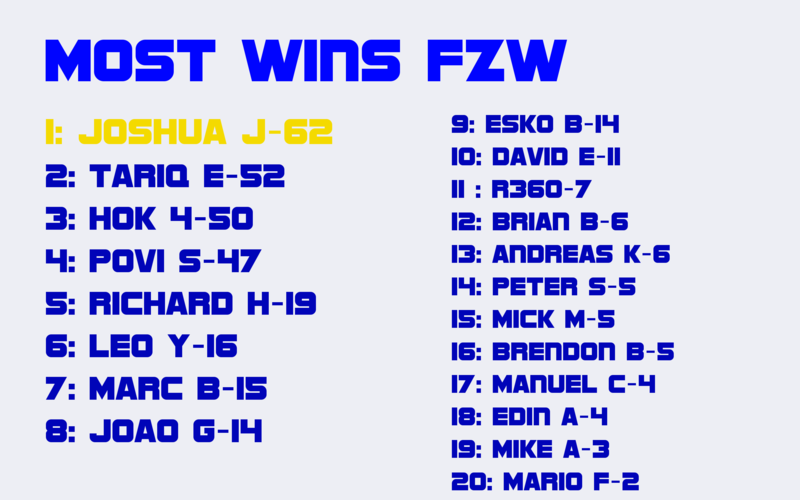 Hok 420 has the record for the most FZW championship wins at 7, his last one was in S13. The closest active manager to his tally is Povi S on 5. Joshua J has the record for the most elite wins in FZW, he's the only one with more than 60. Leo Y has the highest number of FZ championships at 12 (2 more than any other manager). Only R360 has been able to achieve more than 5 consecutive FZ championships (he achieved 8). Povi S is the closest at 5. This season proved to be a very familiar sight for the rookies; as is usually the case in the tier, there was one manager who stood clearly above the rest! The season started with a pair of wins from Luke, he seemed to have finally dialed into the pace that brought him his first FZ championship in S29, and now he looked like the strongest contender for S34, that was until Bram properly showed the full extent of his own talent. From Malaysia up until the final race of the season no one could stop the dutch manager from taking the top stop, again and again and again. He literally became unstoppable and his consistency lead him to the title with relative ease! Rookie may not be the most difficult tier but I think such a dominant performance shows good signs for the following season in pro! Especially considering some of the recent performances of the last few rookie promotees! GL! A little further down the tier, we got a close battle for promotion; Luke, the only non Bram winner of the season vs Stig, making his first proper attempt at promotion. Luke had the lead early on but Stig's lvl 15 team proved to be faster than Luke's new lvl 11 allowing Stig to slowly but surely diminish the gap until it was down to 1 between the two. Now with them both on a virtually even playing field but only a few GP left every point meant so much more than before. With Stig not showing up to most of the final few GP and Luke making sure to bring his team home with some great performances, the gap between the two inevitably stretched in Luke's favour, and even though it only finished with him 1 point above his rival in the end, he claimed the opportunity to move up in FZ! GL! Stig, since you first dropped down to rookie you've been getting closer and closer to promotion, take S35 as an opportunity to finally make the move back up! The same goes for the rest of the tier, S33 and S34 both saw a dutch manager win the champ but who will take the top spot in S35! Pro's champion this season was within a few points of the leader from last season, meaning that one again the winner of the tier dominated the championship. Surprisingly, last season's 4th placed manager, Jade, kicked off the season with a victory, another surprise was seeing Josef put his team at the top of the championship with a brilliant 2nd and 3rd placed finish in Australia. Unfortunately for him his lead over the championship didn't last long at all as Jade continued to win every single one of the next 4 Grands Prix. El Mohico then had a one off decent performance in Monaco, but post this Jade returned to winning for another 6 Grands Prix basically confirming her as the S34 pro champion. Wd and GL in the top tier! With no one else being able to touch the top step until Italy, The rest of the tier were left with an insufficient number of points to challenge Jade but more than enough to pass each other with the few points they had gained already. This, as it satisfyingly usually does in pro, lead to a cascade of points and leaving everyone with somebody to fight! The most notable battle was the one between the manager who came down from elite in S30 against the manager who had never reached the height of the top tier in his entire career. A logical person would have bet on the far more experienced Phill, to take the title, but counting out Dan and his persistent nature would have been foolish too! The gap between the two closed and increased as the season raged on, at one point Phill was ahead, only for Dan to retake the lead and begin to defend his opportunity for promotion. The races began to fly by and near the end the likes of Aaron, Francesco and Pavel won GPs but the two fighting for what really mattered now stayed consistently off the top step. Into the final few races Dan, in 2nd, began pulling away and by the final GP the gap he had was insurmountable. So, after just over 300 pro GP and 18 seasons in the tier Dan will finally get to race in elite! GL and I hope you enjoy your first season in the top tier! Unlucky Phill, you got very close this season, and I know if you could be more active you'd be more than fast enough to compete in elite, GL and hopefully next season will be your chance to move up! GL Wim, Esko, Mohico and Uru for next season! You four were within 24 points of each other, I think the top half of the tier will be incredibly close between you! If you had somehow not believed that a simple 30 point gap wasn't recoverable for the S32 title challenger, you would have almost surely been embarrassed to see Connor take the win and 5th in the 2nd GP of the season, E.Sloan could only get 3rd and 4th as Peter continued to compete and Will got the first elite points of his FZ career (they did not turn out to be his last!). All of this allowed the championship to close up a little more and gave fuel to the roaring fire that was going to be the battle between Bamf & the Blue Rhinos! In China though, there was a surprising amount of yellow on the podium, in fact the top two cars were both that of the yellow Pesp team, as it was eventually revealed to us that Peter was not taking a break from racing and was instead perfectly in the mood to take his 5th elite FZ championship! And now, just as S28, S30 and S32, it looked as though we would see 3 teams give it their all in the battle for the title! The championship leader at this stage, E.Sloan, wasn't having any of it and hit back with a win in Bahrain, Peter was smart and as always kept himself on the podium while Connor once again missed a GP, leaving him virtually no where in the championship. Spain, Monaco flew by, both GPs went to Peter but Monaco proved to be the breaking point for one of the title contenders, the Crown Jewel was ultimately what lead to the "Rhino" completely losing his temper, and leaving a storm of words in during the GP. It didn't take long for everything to calm down once again though and for the racing and fun to return to being the main focus, as it should be! FZ's first British GP was complete chaos, no one really knew what the best strat was but it only made the race even more exciting to be apart of. The most experienced manager in the tier, Leo, decided to try out iGP's first new track since he started playing iGP in 2016 and opted for and S-S/S-M strategy along with Peter. The other two title contenders opted for S-S-S, judging as that was the best strat on the old track, some crazy guys even tried SS-S-S and unsurprisingly their pace proved to be terrible. Ultimately we were left with only 2 top end teams committing completely to the 1 stop, and in the first stint it looked close between the two. Leo had come back from a sub-par qualy to be right up with Peter by their first stop. The two stoppers were only slightly ahead at this point, and the race looked almost handed to the two managers but in the final few laps of the GP E.Sloan and Connor were beginning to come back with their fresher tyres, both Leo & Peter quickly realised that the older softs where no match for the newer ones, leading to Peter's S-S runner dropping off quickly and Leo's only barely holding off E.Sloan and Peter's S-M runner. It made for an exciting GP and hopefully GB will provide us with another in S35! The next 3 wins were shared by Connor, who won FZ's 1000th GP (also uploaded to YT) and Nilvio, getting his first elite win in Belgium, stopping E.Sloan from making big progress. Singapore didn't help either as Peter won the GP, extending the gap even more. After this GP, E.Sloan confirmed that he would be moving to FZW for S35 and that this would be his last chance to beat Peter in OFZ. With only 3 GP left and a mammoth sized gap it looked unlikely he'd be able to claw back the points needed... and in Japan, he didn't. The gap now stood at around 50 points going into the final 2 GP, most were already crowning Peter as the champion, none could have predicted the final shock of the season! Connor finished 3rd, far closer than in S33 but still not title challenger. The fact that he ends the season with the most wins out of anyone in the tier is a good sign for him, and maybe shows potential for further improvements going into S35. Dave completes another season in 4th, this time with more points than in the last, who knows if he'll make the jump to title contender as E.Sloan and Connor did before him. Nilvio then follows with an incredible performance this season from him, I hope to see more good come from him in future. And Will claimed not only his first elite points but also completed the season at a solid 8th with 34 pts! Wd! Mihai, who joined late and now looks to do well in pro before returning to the top tier. But most importantly, the first manager ever tipped to break all the FZ legend's records and the man who currently sits at 7 FZ championships and 4 MotS awards has finally made his return after a 3 and half season absence. After Peter's championship both him and Marc B are now on 7 FZ championships, but who will be the first to 8? Only 17 restless days of racing stand between us and the answer! Throughout the season Shanky, Ivan, John and Max all fought for the top end of the points and regularly swapped positions in the championship. The battle was kept close as none of them won a GP until Shanky in Germany, only for Luke to return to dominance right after and also never failing to be off the top step again handing him a dominant rookie championship win instead of Max or Shanky. Wd Luke, getting such a dominant championship is a great sign for your first FZW pro season in S27! GL! Out of the 4 that were consistently getting points throughout the season, only Shanky and Ivan really started pulling away, by the end of the season Shanky had slightly more consistency and this allowed him to power his way to a 50 point gap to his rival and promotion after S26! Wd Shanky and GL in the new tier! GL to rest of the tier too, no managers moving down from pro this season so there'll be much less to worry about in S27! Moving up to pro we see much of the same thing from Rookie except more dominant. Australia, Malaysia, China, Bahrain and the next 3 GP after that were all won by David E, who finally looked to be in a great position to move back up into the top tier and take a championship with it too. Already much further behind at this point were Danny and Brecht. Even further down was Michael who had joined late in the season but already had some okay performances under his belt. As the season continued Cendric grabbed a win pulling him up the tier and David continued his winning streak soon after. By Belgium David had amassed a substantial lead over his competitors and won the championship, while Michael had managed to make a seemingly impossible comeback to looking like a reasonable contender for 2nd. Brecht had soon become irrelevant to the fight leaving Michael and Danny as the last two to battle for promotion and Michael, sharing 2 of the last 4 wins with David, got all the points he needed to beat Danny to the top two and be the final manager getting a ticket to the top tier for S26. Wd Michael and GL in the higher tier. Congrats David on the championship, you look more than ready for elite! GL up there! Richard, the runner up to Joshua S19, the closest ever FZ championship to date. Peter S, the 5 time elite OFZ champion. GL to the tier, I'm sure these new guys are gonna cause a lot of trouble in S27! Almost unsurprisingly Esko kicked of the season with a win Australia, something he was heavily known for in OFZ, but still an uncommon sight to see someone other than Povi lead the title. The race was close, but not for first, Esko dominated the GP by 6 seconds, already dropping hints at what he would be able to produce for the remainder of S26! To make matters worse for Povi, Esko went on the claim clear victories in the next to GPs too, the only solace he could take from Spain being that David took some points off of the irishman. But then that only lead to Joshua's championship being even more dire while David was reaching incredible heights, a real step forward for him! And what could be better than competing with some of the fastest managers in the entirety of the FZ leagues? Beating some of the fastest managers in FZ! And that's exactly what he did in Monaco to take a dominant 1-2 and his 2nd ever elite victory, just 1 season after his first! Wd! Fortunately for the championship battle, Esko had a dire race and finished with a lack luster 10pts, Povi took 23 pts in comparison, better but still not enough to properly get into contention for the championship! Joshua had an okay GP, but soon it became clear that not only would have David to worry about for S26 but also the up and coming Mick. Two races, 1 lucky win, 1 dominant victory with Andreas up there too and suddenly he was looking to be in the battle for Joshua's 4th place. Just shows how close the tier is now that a couple of victories can put you positions such as this! All of this was stopping Povi from making the comeback he needed though, and suddenly the perspective of everything seemed to shift. It was almost like the story shifted from "how long can Esko can Esko keep this up" to "Will Povi ever catch up". Germany, for me at least, was the decider. After the hectic weather the tier got in GB, no one was excited for another wet race in Germany, and it seems iGP wasn't ready too as half the grid qualified on inters while the other half (the half Esko was in) was on softs. This seemed like game-over for the champ leader at the time but as we all joined the race to enjoy another inters GP, we realised the track was bone dry and everyone was on dry tyres. Povi was left as 1 of a very small number of drivers on SS and by the middle stint the tables had turned and been flipped upside and then thrown out the window as Esko, on his final soft tyre stint went from 15th to 1st in 10 laps, once again snatching a victory from his rival, this time only by 2 tenths. It was an incredible GP to witness and also what I felt was the turning point of the season. It really did begin to feel as if Povi didn't have what he had in the 5 seasons before this. Hungary ended being Esko's 7th win of the season and another good performance from Mick, bringing him into what had now become a 3 way fight between David, Joshua and himself for 3rd. Joshua though, having won at least once in per season for 14 seasons in a row up until this point, wasn't about to lose such a mighty record and won in Europe to get himself back into the battle. He followed this up with a great performance in Belgium while Esko got a 1-2, further pulling him away from Povi. It was at this point that it became clear that barring any massive mistakes from Esko, the championship was over. Mick showed up again out of no where to win his 3rd GP of the season but by this point it was sort of too late and now the battle was between David and Joshua going into the final GP of the season. The final GP of the season ended up being a real mix of strategies making for an exciting GP. Joshua and David opted for the same 1 stop strategy but opting for different tyres! Joshua wet S-M while David trialed M-M. The more usual S-M ended up being faster than the M-M and actually also faster than the usual SS-S-S strategy leading to Joshua winning his 3rd GP of the season and getting 3rd in the championship! Wd Joshua and wd David on such an interesting battle. Wd Esko on being the first since S21 to stop Povi's streak! Unlucky Povi, no championship for this season but hopefully you'll return to to glory or at least get closer in S27. These are the top 20 for FZW's pro tier! On the 13th of April, Formula Zero finally reached it's 1000th running of a GP, if you missed it, you can still watch the elite GP on YouTube now. Below are some of the most interesting race related stats the FZ leagues' players have to offer! Who won FZ's most historic GP? There's only one way to find out!